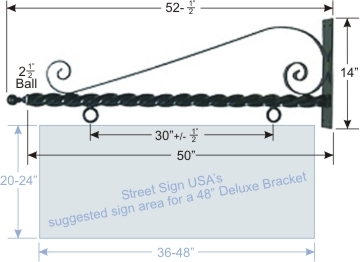 Deluxe Decorative Twisted Scroll Bracket For Hanging Signs - 48"
Decorative Scroll Bracket For Hanging Signs - 36"
This decorative heavy duty wrought iron bracket has been hand crafted with a 1-3/4" twisted tubular shaft, accented in a classic flat bar scroll then finished off with a stylish 2-1/2" ball finial. Bracket can support any type of wood, metal, plastic, composite or carved sign up to 40lbs in weight. This vintage style heavy duty decorative twisted scroll bracket will highlight any carved wood, metal or antique porcelain sign! Scroll work is made of 3/4" flat bar wrought iron. Perfect for very large signs, this bracket compliments archituecture found in historic districts and works well for upscale business signs. Mounting hardware not included. Tubular Twisted Shaft: 1-3/4" diameter, 50" long plus a 2-1/2" ball finial.